The main route between Picton and Christchurch on State Highway 1 is closed due to substantial slips and road damage following the 14 November earthquake. 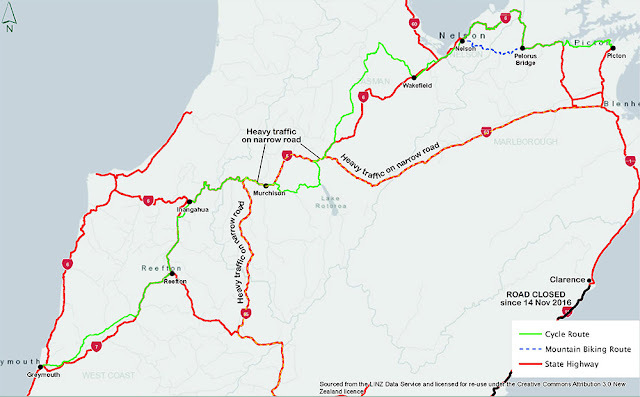 The alternate state highway route between Picton and Christchurch is via state highways 7, 65, 6 and 63 via Murchison and Lewis Pass. However, we recommend that cyclists avoid this route and follow the advice below. • From Picton, follow Queen Charlotte Drive to Havelock, then State Highway 6 to Nelson. There is a 4WD option over Maungatapu Track for mountain bikes. • From Nelson, follow the Great Taste Trail to Wakefield, then ride over Pigeon Valley Road, Dovedale Road and Sunday Creek Road to Stanley Brook. Head south to Tapawera and then follow Tadmor Valley Road to Glenhope, and State Highway 6 to Kawatiri Junction. • From Kawatiri there is no alternative but to follow the ‘alternate state highway route’ for 6km to the Gowan Valley Road turn-off. Take care and consider riding either early in the morning or late in the evening. Ride down Gowan Valley Road to Lake Rotoroa, then over the Braeburn Track (a gravel road), Tutaki Road and Mangles Valley Road back out to State Highway 6. Ride with care for 4.5km to Murchison. • From Murchison, we recommend following State Highway 6 to Inangahua, but riding this section either early or late in the day when traffic volumes are considerably lower. From Inangahua, take Brown Creek Road south, followed by State Highway 69 to Reefton. Updated GPS files (30 Nov 2016). NOTE: The highway repairs will be complete this summer, at which time the main traffic flow will resume along State Highway 1, and this alternative route will no longer be needed.